Silo-Anlagenbau - "Your specialist in silo components"
Conveyor screws for horizontal and ascending conveying (up to 45°) of dry, pulverized to granular bulk goods. Standard tube diameter and a building block system for the assembly of the screws guarantees quality and an optimum price-performance relationship. The standard gear drives were developed especially for the building industry. Two gear drive types, each with 3 transmission ratios, are available. 4-pole, IEC standard motors with outputs from 2.2 to 22 kW permit a broad spectrum of conveyor capacity. The compact design, progressive screw pitch and especially the spring-loaded packing box seal are marked advantages for trouble-free operation. The standard gear drive is connected with the screw helix and the bearing units through maintenance friendly, multiple splined shafts and permits highest flexibility for the planning, manufacture, insertion and installation of the conveyor screws. Individual screw inlet - outlet construction through a flanged-pipe bead or universal inlet for rake and displacement angle adaption complement the building block system and simplify the installation. Hardox 400HB-helix or, according to the conveyed medium, especially treated spiral helix screws provide optimum service life even under extreme application conditions. For optimum design two-gear drive types and 4-pole motors of 2.2 - 22kW are available. For reduced revolutions and performance output weaker motors are used. Preferably, for the reduction of the rpm, 6-pole motors and special gear drives are available. Please ask for the diagram 'conveying output as dependent on screw revolution'! Conveying screws with standard helix pitch tend to "shoot through" depending on the flow characteristics of the material and an inclination of under 10°. 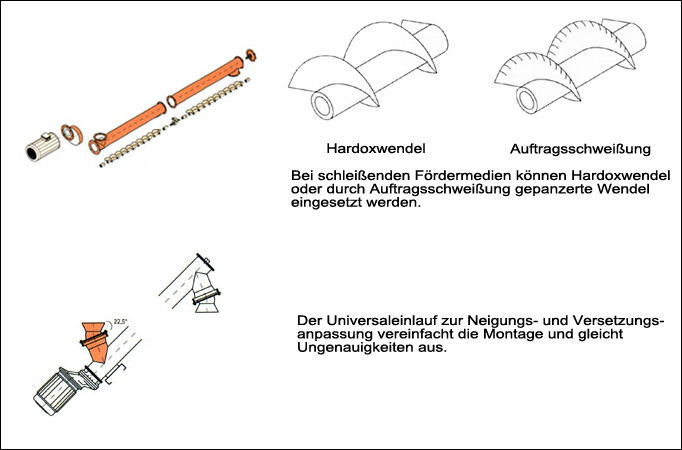 A continuing flowing of the conveyed material after the screw has stopped running can also not be excluded. We recommend the installation of stop flaps at the screw outlet. The table values refer to cement with a medium bulk density of 1,15t/m3 with a uniform material flow into the conveyor screw. The drive outputs refer to 4-pole electric motors according to IEC-standards (construction type B5). 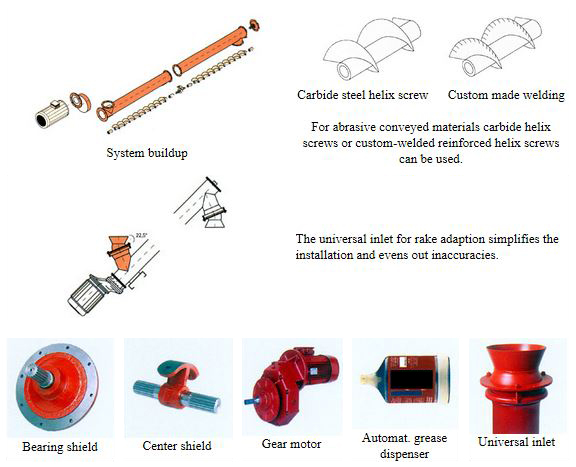 The output can reduce itself up to 10 % in proportional dependency on the screw pitch and conveyed material. Table values without guarantee.